We were looking forward to our next stop very much. 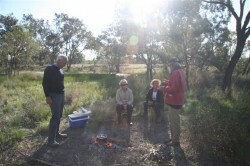 Lynton, Russ’ brother, suggested we stay at his friend’s property, 37 kms East of Walgett. Richard and Beverly Meyer run an 8000 acre station, have a B & B, and passionately run 1,500 sheep. 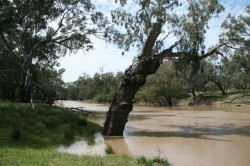 The property has 8 kms of Barwon River frontage, which is quite high and flowing well at the moment. Caloola has some Warrambools running through the property, which we have discovered is different to a Billabong; not a creek; but an overflow for a rising river. It is also not an Ana branch, but still a short alternative course for the river when the river is high. Richard and Bev made us feel most welcome and suggested a great camping spot over looking the river. We had our own flushing toilet and wood-fired shower, luxury! We spent the first morning exploring their property, trying to see all the birds that would be attracted to the area with the big wet. We had a very pleasant picnic lunch by the river. That evening Bev and Richard hosted us to an excellent meal and a night of reminiscing and conversation. The next day we did some more exploring and in the afternoon Richard and Bev provided a bush cuppa of billy tea before we helped them set out the alignment of a new fence. That evening we had a late BBQ over the fire and then Bev, Richard and their friend Margo joined us for some more conversation around the fire. We were sad to leave but we have to keep moving so we can fit in all the things we want to do before returning to home. Tomorrow it is off to Bourke and setting up to watch the grand final replay. After that, depending on the weather we will travel to Mt Gundaboka National Park and then down the Darling to stay on a couple of stations before heading home. Unfortunately some rain is being predicted over the next couple of days so we will have to check in at the Police Station before we leave to make sure the roads are all open. Hello Russ &amp; Marg – I have a family history enquiry about Miss Susie JAFFRAY. I am hoping you can help with the identification of a girl in a photograph. Are we able to correspond via email?